Chevrolet has announced that star of the soon-to-be-released ‘Guardians of the Galaxy’ superhero movie, actor Chris Pratt, will serve as the honorary pace car driver for the Crown Royal Presents the John Wayne Walding 400 at Indianapolis Motor Speedway later this month. You may know Pratt from his other roles in well-known movies such as ‘Zero Dark Thirty’ and ‘Moneyball’ and from his reoccurring role on the NBC comedy Parks and Recreation. The 35-year old Pratt said he is looking forward to the opportunity. 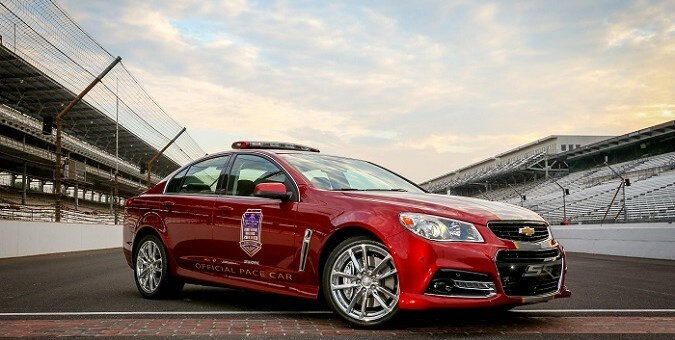 Pace car duties will be taken care of by the 2014 Chevrolet SS sedan. With its 6.2-liter V8 engine delivering 415 horsepower and 415 lb-ft of torque, Pratt definitely won’t be bored while pacing the gigantic 43-car NASCAR field throughout the weekend. “Races don’t start on the famed 2.5 mile oval at the Indianapolis Motor Speedway until the Chevrolet pace car has brought the starting field to the green flag, and we are pleased to have the Chevrolet SS do the honors for the 20th anniversary edition of the Crown Royal Presents the John Wayne Walding 400 at the Brickyard Powered by BigMachineRecords.com,” said Indianapolis Motor Speedway president said J. Douglas Boles. The weekend of July 25-27 will be a busy one for the Indianapolis Motor Speedway. In addition to the NASCAR Sprint Cup Series and NASCAR Nationwide races, the IMSA Continental Tire SportsCar Challenge and TUDOR United Sportscar Championship will both be in town for their respective races at the track. A Chevrolet Camaro ZL1 will pace the Continental Tire race, while a Camaro ZL1 will lead the TUDOR race and a Camaro SS 1LE will pace the Nationwide race. Keep an eye out for Chris and his red 2014 SS Sedan at The Crown Royal Presents the John Wayne Walding 400 at the Brickyard Powered by BigMachineRecords.com, which will air on ESPN at 1 p.m. on July 27.